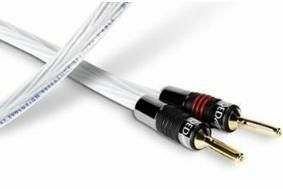 QED's new XT Evolution speaker cable | What Hi-Fi? The cable is designed in a ‘figure 8' configuration, with each positive and negative conductor using five individually insulated, 99.999% pure silver-plated oxygen-free strands. These are wound round a hollow central tube, and held in place with a 100% Mylar wrap and a 5mm diameter clear polyethylene outer jacket. The company says this creates "The result is a cable that boasts significantly lower impedance than a traditional speaker cable with pure copper cores of the same cross-sectional area. QED cables are distributed by Armour Home Electronics.